For viewers interested in early filmic interpretations and presentations of courtroom drama, exploration and exploitation of mob mentality, and the military authority’s corruption and manipulation of the chain of command, this film is up your alley. Although I question the historical accuracy of some of the events depicted, the story is nevertheless entertaining. The Life of Emile Zola is our second biopic that we have viewed thus far, and a significantly stronger representative of the genre than The Great Ziegfeld. I do have a confession to make in regards to Emile Zola, I had never heard about the author until I saw this film. After watching the film, I did do a small amount of research about the author to supplement my knowledge as well as to assess the accuracy of historical information in the film’s portrayal. As with all films in Hollywood based upon historical events, there has to be a certain amount of manipulation of a story to make it fit into the recognized tropes of the narrative experience. This manipulation at times can affect the credibility of a film as a work of non-fiction; however, The Life of Emile Zola does not portray any glaring historical inaccuracies that would affect the film’s overarching message. The film can be divided into two into two main segments: the life of Emile Zola prior to the Dreyfus Affair, and Dreyfus Affair as told through the point of view of Emile Zola. For those of you who have never been to Hebrew School, studied Anti-Semitism, or studied late 19th century/early 20th century French history, the Dreyfus Affair is one of the most preeminent court cases in French history. The Dreyfus Affair details the trial and conviction of Captain Alfred Dreyfus on charges of treason against France. The Jewish captain was indicted with no evidence of these charges by the French Military courts and banished to Devil’s Island in French Guyana. Despite a vocal minority maintaining his innocence, the French government and press demonized the convicted man and unabashedly ridiculed his lack of allegiance to the country of France. Even when soldiers of the French army came forward to testify that they had evidence that Dreyfus was wrongly convicted and that Major Esterhazy was the real spy, the French government acted in an abhorrent manner. They jailed the soldiers and officers who came forward and formally pardoned Esterhazy, rather than dealing with the backlash of admitting that they had incorrectly charged Dreyfus. The Life of Emile Zola paints the picture of the man who would impact the trial, and ultimately ensure that justice would prevail over the bureaucracy and corruption of the French judicial system. 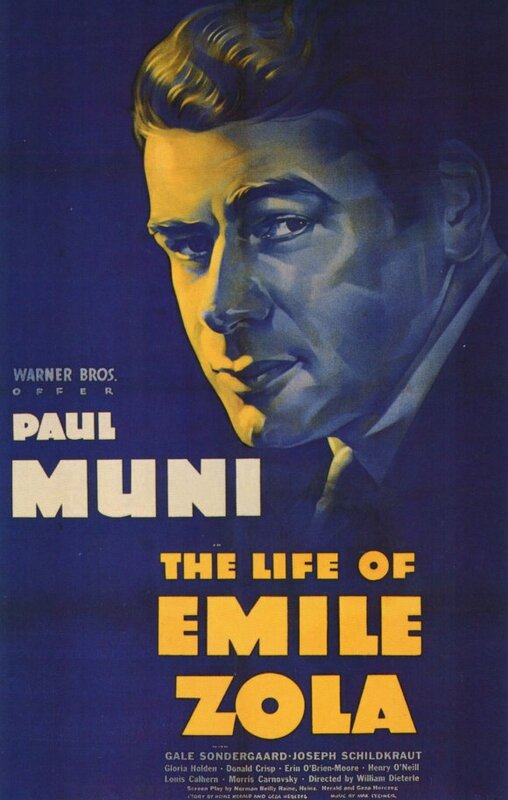 The film starts with Emile Zola (Paul Muni), living with childhood friend, Paul Cezanne, in a meager Bohemian artist apartment in Paris. Through the lens of Zola’s bohemian idealism, the film portrays the protagonist rallying against the system with brutally honest commentary on the military’s actions in their defeat in the Franco-Prussian War. It also depicts him as an advocate for social justice, championing under-represented groups like French prostitutes in his uncensored portrayal of the life of a street-walker entitled, Nana. Through a rather epic montage sequence, the film catalogues Zola’s countless successes as viewers see the protagonist transform from struggling idealistic writer, to a wealthy and prolific established author. The film’s first act was a bit too prolonged for essentially a prologue to the main course of action, and I was left feeling very underwhelmed with how the story was progressing. My feelings however were ameliorated by the reemergence of Paul Cezanne, as he visits the fatter, richer, and more complacent version of his former childhood friend. Cezanne accuses Zola of becoming a member of the class that he had once had criticized, and castigates Zola for having no backbone. So begins the second half of the film, the point in which this film begins to become worthy of the accolades of the Academy as well as earn the distinction of inclusion in the National Film Registry by the Library of Congress. This is the point in the film that the case of Alfred Dreyfus is introduced into the story arch. The third-person omniscient narrative technique utilized by the film’s story shows the injustice of Dreyfus’ accusation, conviction, and sentencing, in order to enrage the audience. However, it is quite bothersome the way that the film downplays the significance of anti-Semitism in its portrayal of the Dreyfus case. The film does not ever overtly describe Dreyfus as a Jew, but rather shows the military officers pointing to Dreyfus’ name on a sheet of paper with Jew listed next to his rank and nationality. This mention is done so subtly that a distracted viewer could easily miss this all-important fact. The under-emphasized reference of anti-Semitism is very fitting of a Post-Production code Hollywood, which does not wish to overstep its highly regulated constrains. Also, in an era where national celebrities like Henry Ford and Charles Lindbergh were outspoken anti-Semites, hate-mongering was still very much en vogue. Emile’s attitudes towards the Dreyfus case change drastically when Dreyfus’ wife appears at Zola’s door to plead her case. At this point in the film, Alfred Dreyfus has already been banished on Devil’s Island for years and Zola is Mrs. Dreyfus’ last hope. Originally he is very cold to her, but as she leaves his residence she also leaves a folder of evidence that proves without a doubt her husband is innocent. There is a great shot of Zola contemplating opening up the folder, an item he perceives as a metaphorical Pandora’s Box. As he his vacillating between the actions of opening the folder or ignoring it, he notices a portrait of himself painted by his former roommate, Paul Cezanne, and Paul’s critical words replay in his head. The words trigger an impulse that seemed long-suppressed by his wealth and fame, and his muckraking spirit overtakes his desire for peace and comfort. Determined to prove himself as a harbinger of justice once more, Emile Zola pens an op-ed that appears on the front page of a major newspaper in France entitled “J’accuse”. In the article, he accuses the French military of having knowledge of Dreyfus’ innocence and participating in an elaborate cover-up. His actions were performed with the sole purpose of bringing the Dreyfus case back to court through a Libel trial. This trial would allow him to present evidence that would exonerate Alfred Dreyfus in the public sphere, but if his efforts proved unsuccessful, he would be sentenced to jail time. The second half of the film is enthralling, poignant, and a fantastic portion of filmmaking. If the first half could have achieved the same amount of exposition with a greater focus on brevity, I would have rated the film much higher. Overall, I found the film thought-provoking and a great example of 1930’s filmmaking. In particular, the trial scene showcased the talent of the actors and the emotionally manipulative power that the film evokes. I highly recommend this powerful and thought-provoking film, because it showcases a horrible example of hatred and bigotry that is all too often forgotten. The Innocence Project was founded in 1992 by Barry C. Scheck and Peter J. Neufeld at the Benjamin N. Cardozo School of Law at Yeshiva University to assist prisoners who could be proven innocent through DNA testing. To date, 289 people in the United States have been exonerated by DNA testing, including 17 who served time on death row. These people served an average of 13 years in prison before exoneration and release. The Innocence Project’s full-time staff attorneys and Cardozo clinic students provide direct representation or critical assistance in most of these cases. The Innocence Project’s groundbreaking use of DNA technology to free innocent people has provided irrefutable proof that wrongful convictions are not isolated or rare events but instead arise from systemic defects. Now an independent nonprofit organization closely affiliated with Cardozo School of Law at Yeshiva University, the Innocence Project’s mission is nothing less than to free the staggering numbers of innocent people who remain incarcerated and to bring substantive reform to the system responsible for their unjust imprisonment.